Then there is the “Yes” girl – the Coca-Cola Company’s website points out it would never say “girl” these days. The most famous “Yes” girl ad was from 1946, in a billboard ad painted by Haddon Sundblom, who had also been painting the Coca-Cola Santa Claus, the character’s face inspired by his own, since 1931. The ad features a woman in a bikini, sat on a beach, perhaps propping herself up after sunbathing, being handed a bottle of Coke by someone outside of the frame. 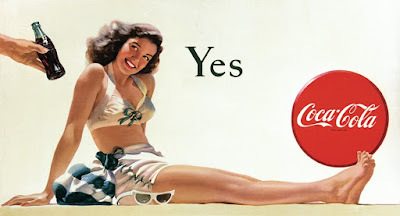 Other than the Coca-Cola logo displayed on a red disc like an enormous button, the only other element is the word “Yes” - the woman is sitting on sand, but the background is white, as in blank. 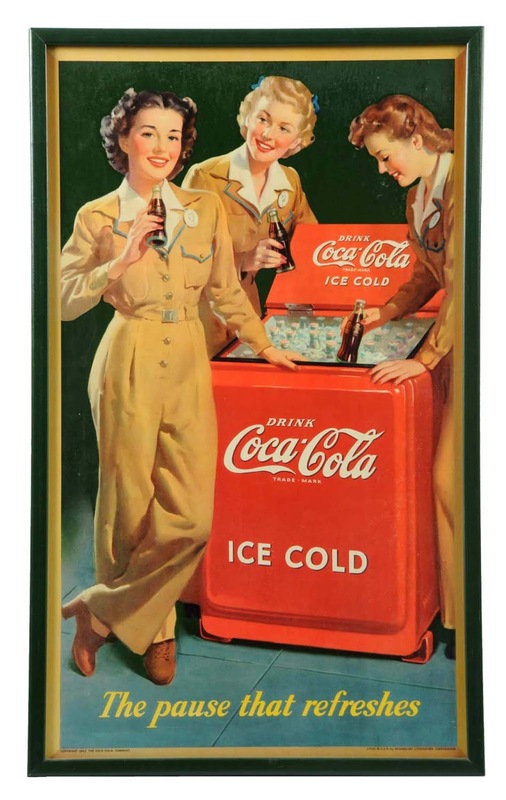 I first came across this ad in the definitive history of the drink and the company, Mark Pendergrast’s “For God, Country and Coca-Cola” – this book also happens to print, towards the back, what is believed to be the secret recipe for Coke which, apparently, includes coriander, cinnamon and nutmeg. It just didn’t make sense to me: who is saying “yes” to what? Is it from the woman to the drink, or from the hand to the woman? Am I, looking at the tableau, supposed to be saying “yes” to the drink, or the woman, or both? 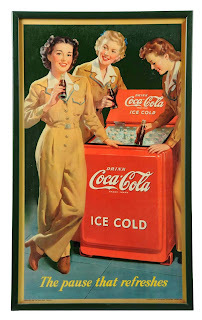 It should be noted that the Freudian, psychological approaches to advertising and consumer behaviour would only become commonplace in the next ten years, and Coca-Cola had its own rules on how people would be used in advertising, seeing as it is drunk by everyone: both women would be seen in roles as varied as men in Coke ads, especially in uniform during the Second World War, and even after a switch in advertising agency in 1950 meant painted ads were swapped for photo shoots. Perhaps, at that point just after the end of the war, a focus on being seen to enjoy life was paramount. 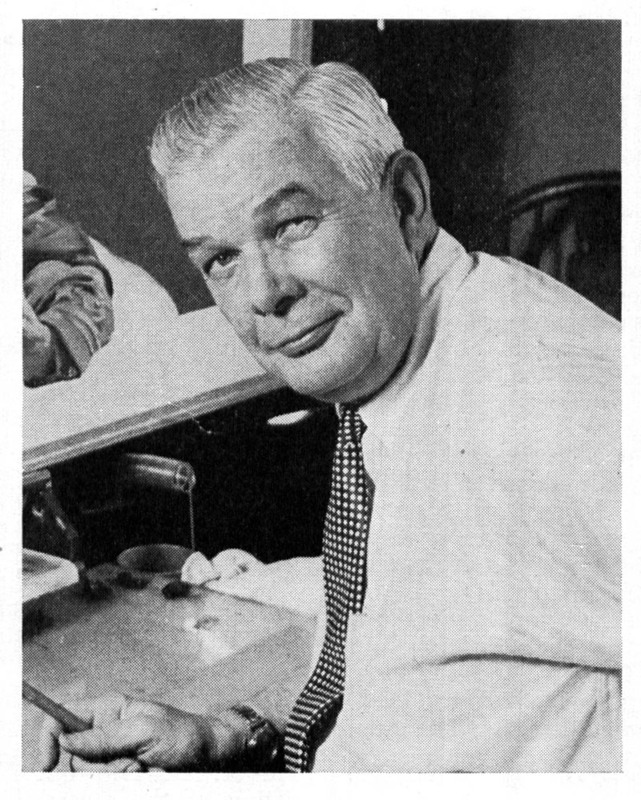 With 2018 eyes, the 1946 “Yes” ad does not look innocent, but it is only because we are wiser to practices used in advertising since then, surrounding the use of women as a glamourous garnish, that would be interpreted as sexist. Along with Sundblom’s other painted ads for Coke, the “Yes” girl occupies the same area of popular art as John Gilroy’s work for Guinness, including the famous toucan, but we know straplines like, “Lovely day for a Guinness,” and “Guinness is good for you,” are not claims Guinness would, or could, make nowadays. 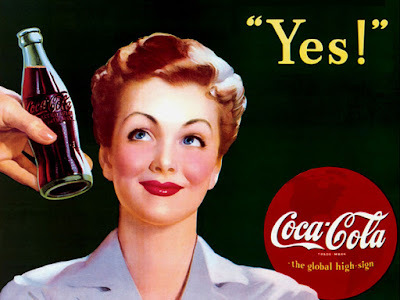 Having the single word “yes” is too oblique for an ad, and too open to interpretation one way or the other – perhaps Coca-Cola should have put the “yes” in quotation marks, like they did elsewhere.